Girls Gone By is a prolific publisher of children’s books (over 40 new titles in a recent seasonal list) but few find mention in BfK. The reason, as you may guess, is that their clientele is mostly drawn from gone-by times – readers finding a way back to when Dorita Fairlie Bruce was author-of-choice for fourth form prizewinners and F O Joan Warrelson was ‘skimming the cloud tops like a dolphin in a silver sea’. It is fitting therefore that GGB should give the platform over to Mary Cadogan for what amounts to her eightieth birthday present to herself (a compliment which she here and there returns by puffing some of their stock). 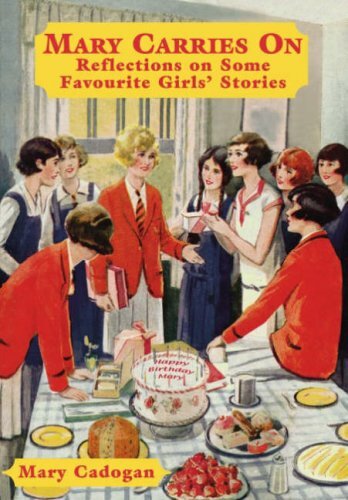 For it is Mary who, for fifty years or so, has been charting the evolution of ‘girls’ stories’ (and quite a few boys’ ones too) from their Victorian origins to their heyday in the 1930s – teasing out the variant characteristics of their authors and of the book and periodical publishers who offered a sometimes penny-pinching hospitality to their work. Mary’s absorption in the subject stemmed less from an awareness of its neglect (only when she and Patricia Craig published You’re a Brick, Angela! in 1976 did its intricacies become apparent) than from plain affection. She had been devoted to the fictions and the story-paper serials as a child and she set out to examine the nature of the genre in its full extent as a sympathetic observer rather than a critic of its often comical absurdities. Something of her childhood encounters with the stories occurs in Mary Carries On – a title which intentionally echoes the phrasing in many a constituent volume of the manifold schoolgirl series – but the ‘reflections’ are more on aspects which show their diversity. Thumbnail essays on the Big Players on the pitch: Brazil, Oxenham, Brent-Dyer et al. are only to be expected but the originality of the collection is in Mary’s engagement with a dozen or so rarely noticed elements: sometimes specific like ‘Morcove Stories in the Schoolgirls’ Own’, sometimes categoric like ‘Spotlight on some Secret Societies’. There can be nothing but admiration for Mary’s use of a host of obscure resources for her liberal plot synopses, juicy quotations and heart-stopping illustrations: oh the indignity of Arthur Augustus D’Arcy being ejected from Cliff House by the terrifying Miss Bullivant... and there are the Silent Three, gowned, cowled and masked, as ready to right wrongs as the Caped Crusader himself. As befits a celebratory volume (although doubts must be expressed over Mary’s advanced age – is this a leg-pull by Clara Trevlyn?) repetitions are bound to occur from the author’s earlier books – seventeen, she tells us towards the end. On one or two occasions though she gives illuminating glimpses of authors, illustrators, editors and suchlike whom she encountered in their composition and these awaken a hope that she might tell us more of her long adventure among the obscure thickets of popular literature. It would have been instructive too to have her opinions on the very different stuff that confronts today’s pre-adolescent readers. Will that one day engender an affection similar to what the gone-by girls now have for the school at the chalet and the bosom friends from Brazil?